BRANDON – Two Brandon University (BU) students are among a group of international educators gathering in Tampa, Fla., for the Council for Exceptional Children (CEC) 2018 Convention and Expo. The CEC organizes the conference, which is the largest special education professional development event for educators. 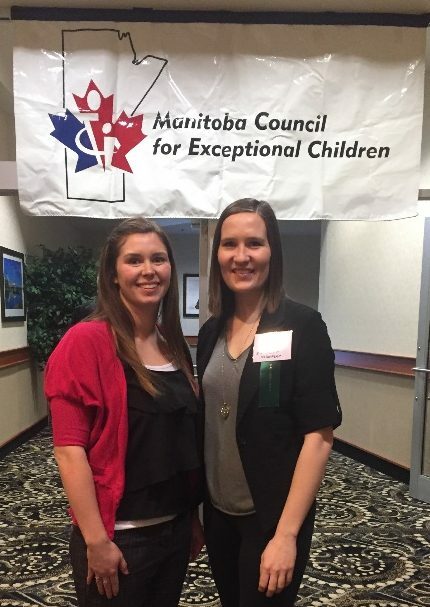 BU Education students Kaitlyn Cochrane, left, and Brooke Drummond are participating in the Council for Exceptional Children 2018 Convention and Expo in Tampa, Fla.
Brooke Drummond, of Holland, Man., and Kaitlyn Cochrane, of Silverton, Man., earned the opportunity to attend the professional development event through their involvement with the BU/Westman/Parkland Chapter of the Manitoba Council for Exceptional Children (MCEC). The two BU education students are taking part in various sessions and workshops at the Convention and Expo, which began on Wednesday and concludes on Saturday. Drummond and Cochrane hold positions on the BU council executive, which is a branch of the provincial MCEC group. The mission of this group is to “advance effective practices in providing services to children and youth with exceptional needs and to support persons working to achieve those practices.” They have volunteered at past MCEC conferences, attended provincial executive meetings, and organized events in Brandon. In response to BU students’ effort and investment for this organization, MCEC has covered their travel expenses and registration for the event. The professional development will not stop once the Drummond and Cochrane return from Tampa. The BU MCEC Chapter is organizing a professional development conference in Brandon on May 10 and 11. Speaker Jonathan Mooney from California will deliver the keynote address and various professionals will conduct breakout sessions the following day. Upon graduating from BU this spring, Drummond and Cochrane plan to apply what they have learned from their experiences with CEC to their careers as teachers.